Every business – yes, every business of whatever size – should have a crisis management plan. Part of that plan should be what happens if the boss (or the business innovator or, indeed, the holder of any post on which the future of the business depends) becomes ill or dies. Death in service is not an issue to be considered only from an employee’s pension policy point of view. Nor is it just about keeping the organisation running for the short term – keeping the lights on, the door open, the phones working, the computers running, the orders coming in and the products and services flowing out – while a successor is found. When an employee, in whatever role, has a massive impact on the success of the business, having a succession plan is essential. Who will lead the organisation through the turbulence and beyond – keeping staff committed, customers confident, suppliers confirming orders? Who, in the case of a business that is a market leader known for its groundbreaking products, will be responsible for driving innovation? Mitigating for those extreme circumstances takes courage. Talking about someone’s death, particularly in their presence and when the risk looms, is a tough task. But it must not be shirked out of sensitivity or fear. In the case of Apple and Steve Jobs, who died last Wednesday (5th October), the succession planning task was exceptionally difficult. Someone so focussed, so committed, so fixed on a business is very hard to replace. Steve Jobs was a one-off. There will, of course, be other one-offs – but their one-offness will be different and it might take years to find him or her. Another option, then, is to innovate ahead. That is why Steve Jobs left four years’ of new products waiting to be developed and launched. Apple was his life – so much so that he sanctioned an official biography so his children could know him and understand why he worked so intensely. It was natural for him to want to ensure Apple’s future. Looking ahead – in so many dimensions – was what Steve Jobs did all the time. He clearly wanted to buy time for Apple by leaving it able to continue rolling out new products during the succession gap, to ensure its future for as long as he could. Replacing him will not be easy. There is another smaller (for Apple) but fundamental (for many businesses) aspect that Apple got right. Businesses which face events that have an impact on others’ lives (such as deaths), or their own success, should be prepared for an instant change to their website. Airlines are well ahead of most businesses – with ready-to-launch dark sites to replace their usual websites. After all, if a plane crash results in multiple deaths, it is not appropriate for the home page to advertise holidays or display photos of people laughing with joy as they run through sunkissed surf. What that dark site should contain depends on the business. 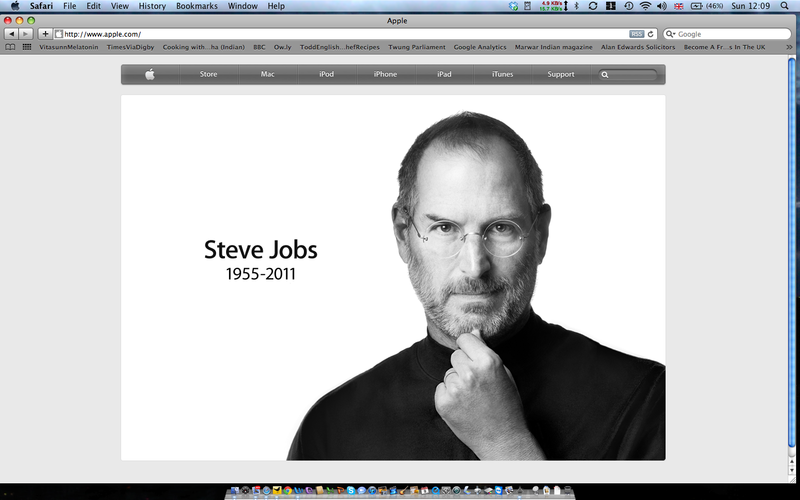 In Apple’s case after Steve Jobs’ death, there were several options. What it has chosen could not be more effective or more appropriate. In Apple’s typical sleek, clear, sharply-focussed trademark way its home page is a simple tribute: a photograph of Steve Jobs, his name and his life span. There is no need for a detailed obituary. This home page says it all. Apple has, yet again, shown exemplary crisis management planning and response. All businesses should take note.